MTSU Magazine "I Am True Blue"
One hundred and thirty-eight and counting. 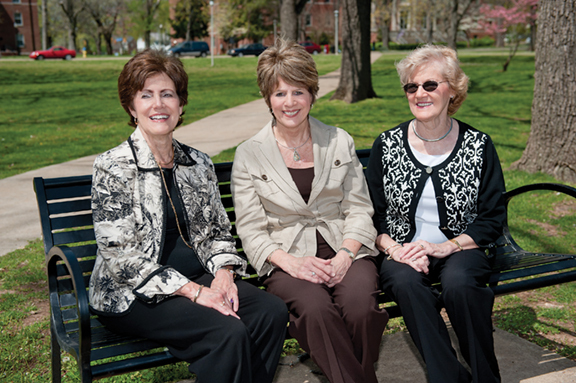 That’s how many combined years the Roach sisters of Woodbury have worked at MTSU. Youngest sister Betty Roach Smithson (middle) is the only sister still working on campus. Entering her 46th year in the Student Affairs Office, Betty has worked closely since 1965 with student groups, fraternities, cheerleaders, and student government workers. Odds are good she’s met as many MTSU alums as any other administrator on campus. “I’ve worked with a lot of students hands on,” she admits. So will she end the Roach sisters’ 138-year streak any time soon? “I’m not going anywhere,” she promises. Eldest sister Martha Roach Turner (right) began the sisters’ streak in 1958, taking a secretarial position in the Field Services Department. She’d later become director of placement for the University, growing the office to a staff of 10 before retiring after 45 years of service. When Martha took a brief sabbatical from MTSU in 1960, she referred her sister Frances Roach Rich (left) to be her replacement. That began Frances’ 48-year run at MTSU, mostly spent in Student Affairs, but ending in MTSU President Sidney A. McPhee’s office last year. That motherly instinct for togetherness might stem from the fact that all three Roach sisters started out working in the family’s dry goods store, standing on boxes to pull items down from high shelves for customers and working behind the cash register. While at MTSU, the sisters had a reputation for being seen together, whether at lunch or carpooling to and from work. Then vice president Dr. Bob Glenn once remarked that the Roach sisters’ maiden name was appropriate given that you’d “never see just one of them” out and about on campus. Asked what’s changed about MTSU over the past half century, the sisters point to the University’s growth in physical size and academic offerings.